This page illustrates the updates made to the SEA boundaries between 2013 and 2015. Please see the Hearings & Meetings tab for more information on the currently proposed SEA ordinance scheduled before the Los Angeles County Regional Planning Commission on May 17, 2017. The Los Angeles County 2035 General Plan Update, including the SEA Program Goals and Policies, Countywide SEA and Coastal Resource Areas Map and SEA Descriptions were approved at the October 6, 2015 Board of Supervisors public hearing. The 2035 General Plan went into effect on November 5, 2015 with the updated SEA Boundaries. The Los Angeles County General Plan 2035, including the SEA Program Goals and Policies, SEA Program Policy Map (Figure 9.3) and SEA Descriptions were approved at the March 24, 2015Board of Supervisors public hearing. 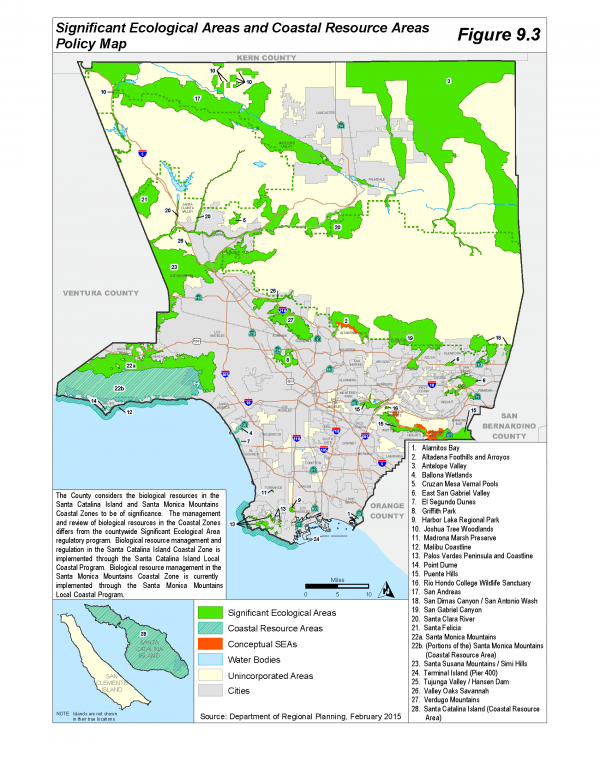 After the Santa Monica Mountains Local Coastal Plan was adopted minor changes were made to the proposed SEA Map to reflect the final approved boundaries of the Coastal Zone. The changes are not generally visible in figure 9.3. Here is a sample image of the adjustment, with the adjusted Coastal Zone in red, the Proposed SEA in green and the Coastal Resource Area in diagonal stripes. The Regional Planning Commission recommended for approval to the Board of Supervisors, the 2035 General Plan, including SEA Program Policy Map. The Los Angeles County Regional Planning Commission held a public hearing on the proposed update of the Los Angeles County General Plan and the Draft EIR on December 10th 2014. After hearing testimony the Commission unanimously moved to adopt a resolution recommending approval of the General Plan Update Project to the Board of Supervisors. 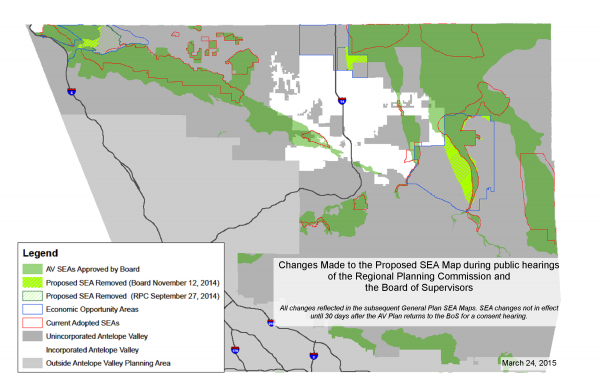 This approval included the Countywide SEA Map (Figure 9.3), which includes the changes to the Antelope Valley Area Plan SEA Map that the Board of Supervisors heard on November 12, 2104. At the December 10th hearing the Regional Planning Commission expressed concern that the SEA Map should require specific review for compatibility with community plans in the following communities: Altadena, Rowland Heights and Hacienda Heights. In order to accomplish this review, the Regional Planning Commission recommended creation of a new SEA category, known as the “Conceptual SEAs”. 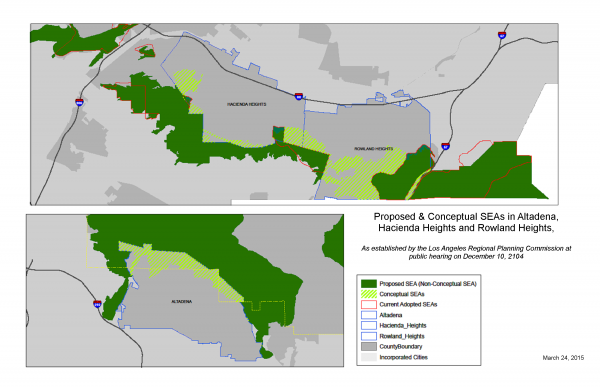 The Conceptual SEAs are the proposed SEAs prior to the December 10th hearing which have been presented by the Department of Regional Planning within the areas contained in the Community Plans for Hacienda Heights, Rowland Heights and Altadena. For these communities the adopted SEAs will be retained and the designation of Conceptual SEA were added as overlay showing where the proposed SEA Boundary updates would be within these three areas. Conceptual SEAs will replace the current adopted SEAs in these three communities only as each community amends or updates its own community plan. These changes have been are reflected in Figure 9.3 which was submitted to the Board of Supervisors in the Board Submittal for the March 24th hearing. The Los Angeles County Board of Supervisors held a public hearing on the proposed Antelope Valley Area Plan and its appurtenant Final Environmental Impact Report on Wednesday, November 12, 2014. After hearing testimony from about a dozen people, the Board unanimously indicated its intent to approve the Area Plan Update and certify its Final EIR. The Antelope Valley Area Plan Update was Item No. 64 on the agenda. This intent to approve the Area Plan Update and certify its Final EIR includes updates to the SEA Policy Map, SEA Program Goals and Policies and SEA Descriptions within the Antelope Valley Planning Area. Please refer to the Antelope Valley Area Plan Webpage for further updates or see below for links to additional hearing materials. These changes have been made within the Antelope Valley Area Plan, within the Renewable Energy ordinance, and are reflected in the latest draft SEA ordinance update (Draft No. 7). On October 8, 2014, staff presented edits to the SEA Ordinance (Draft No. 6) to the Regional Planning Commission. The Regional Planning Commission moved to take the SEA Ordinance off calendar at this hearing. The 2035 General Plan Update, including the SEA Policy Map and SEA Program Goals and Policies continued forward to the RPC on December 10th. The Los Angeles County Regional Planning Commission held a public hearing on the proposed update of the Antelope Valley Area Plan and the Draft EIR on Saturday, September 27, 2014 in the Antelope Valley. After hearing testimony from approximately 70 persons, the Commission closed the public hearing, and recommended approval of the project to the Board of Supervisors with additional changes. The changes can be seen above in the map for the November 12th hearing of the Board or downloaded below. The content of this meeting focused on how the SEA boundaries are determined and included the Department’s responses to public comments regarding the boundaries. Department staff requested that the commission continue the SEA Program Update from the date of June 25th to the date of August 6th to allow more time for public input. Please review the memos below for more information. The SEA Ordinance Draft 5 and supporting materials were presented at Hearing #3 of the General Plan Update, a public hearing of the Regional Planning Commission.